Got a minor cut, but no Neosporin? Rather than running to the nearest drug store, simply grab a jar of honey from your pantry and apply directly to the wound before wrapping with a band-aid. Honey is one of the world's oldest tricks in the book for dressing a skin wound and contains antibacterial, anti-fungal properties that makes it perfect for getting rid of your zits, relieving your nasty sunburn, and even moisturizing your skin. We all know that honey makes for a great topping for your breakfast toast, but did you know that honey can also help you get rid of intestinal parasites and worms? Tell your unwelcome body intruders to bug off by regularly drinking a concoction of honey, water and vinegar. And if you are ever lacking in the sugar department when you're baking, honey also makes for a great baking substitute. 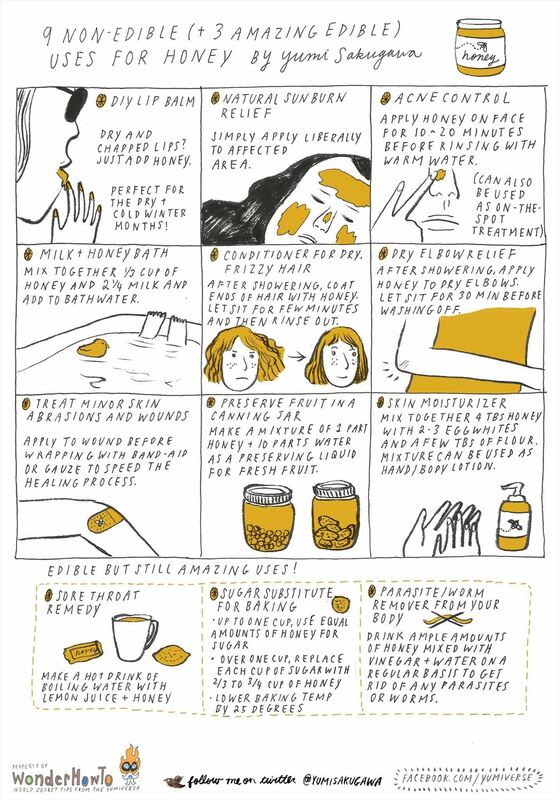 Got your own experiences with using honey in unexpected ways? Share with us by commenting below!